Autism. It’s a condition that we see weekly as general practitioners. The question is, do we observe it? And if we do, what do we see it as, a series of deficits, or as a set of different strengths that can be celebrated? For the last few days, I’ve enjoyed being a delegate at the Asia-Pacific Autism Conference in Sydney, a series of some cognitively stimulating discussions covering the full spectrum of being on the spectrum. There’s always so much that can be gleaned from conferences like these, but for me, the take-home messages as a GP came at the book-ends of the first session and the last. One of the first keynote presentations came from researchers at the Olga Tennison Autism Research Centre (http://www.latrobe.edu.au/otarc). Prof Cherl Dissanayake and Dr Josephine Barbaro presented their research on a tool they developed called SACS-R, an early detection tool to screen for infants at higher risk for developmental disorders. Early detection of children on the autism spectrum is very important, something recognised by the AMA in their position statement late last year (https://ama.com.au/position-statement/autism-spectrum-disorder-2016). Despite being important, early detection can also be tricky, and many children on the autism spectrum who are relatively high functioning are often missed in general practice. Barbaro and Dissanayake have previously tested this tool, training community child health nurses to use it as part of the standard infant health checks. The results of their work showed that the tool was robust (Estimated sensitivity ranged from 69% to 83.8%, and estimated specificity ranged from 99.8% to 99.9% for babies between 12 and 24 months – Barbaro and Dissanayake, 2010). Barbaro and Dissanayake have continued to develop the tool, but more importantly, they have refined the tool to utilise only the factors that had the highest sensitivity, and then turned the tool into a free app, untethering the initial assessment process from the domain of professionals and potentially putting it in the hands of every parent anywhere in the world via a smart phone. The results of their study are still being finalised, but they claim that the SACS-R tool on the app has a positive predictive value of 82%, a negative predictive value of 97%, a specificity of 99.58% and a sensitivity of 72%. The power shift that an app like this brings is important for us as GP’s. In time, parents will be doing their own assessments at home and coming in to their GP with a recommendation to have a further assessment, and we need to be prepared for this and take the recommendation seriously. But there’s also a prime opportunity here, to use the app to enhance early screening for developmental disorders in general practice, by sending a link to the parents booking in for their baby’s 12 and 18-month immunisations and discussing the results of the assessment with them when they come in. This could also be in addition to the professional version of the program that Barbaro and Dissanayake are in the process of developing. Given the preliminary results of their longitudinal study (not yet published but in its final stages) showing a prevalence of up to 1 in 43 children, it’s likely that we will be picking up several new cases a year. 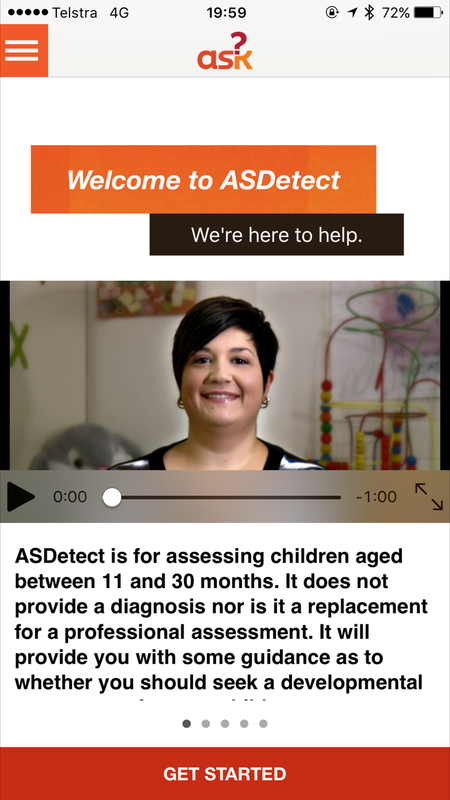 If you want to review the app yourself or consider recommending it to your patients, it’s called ASDetect and it’s available from the App Store or Google Play. At the other end of the conference, Dr Barry Prizant presented a keynote address on “Uniquely Human: a different way of seeing autism”, based on his book of the same name and his decades of work with people on the autism spectrum. His theme was that most people see autism as a negative. In times gone by, children on the autism spectrum were seen as profoundly deficient, to the point that they weren’t considered a person. Even today, some pundits have said that “autism is a lost, hellish world” while others have likened having autism to being a victim of the holocaust. On the other hand, self-advocacy is growing amongst those with autism, who are working to try and change the social view that autism is a series of weaknesses to overcome, but differences to be celebrated. Not only that, but more people on the spectrum are designing research projects to understand the condition better and to translate those advances into tangible benefits, taking self-advocacy to a whole new level. For ASD and the average GP, change is coming – good change that will empower parents to get an earlier diagnosis, and for those with ASD to get the early intervention that will benefit their weaknesses, complement their strengths and accept who they are as people. As GP’s, we need to be flexible and accepting, observing the strengths that autism can bring to our patients, not just seeing the weaknesses. “My name is Erin and I am a Research Assistant at La Trobe University. Currently, I am working with Dr. Josephine Barbaro on the ASDetect project. 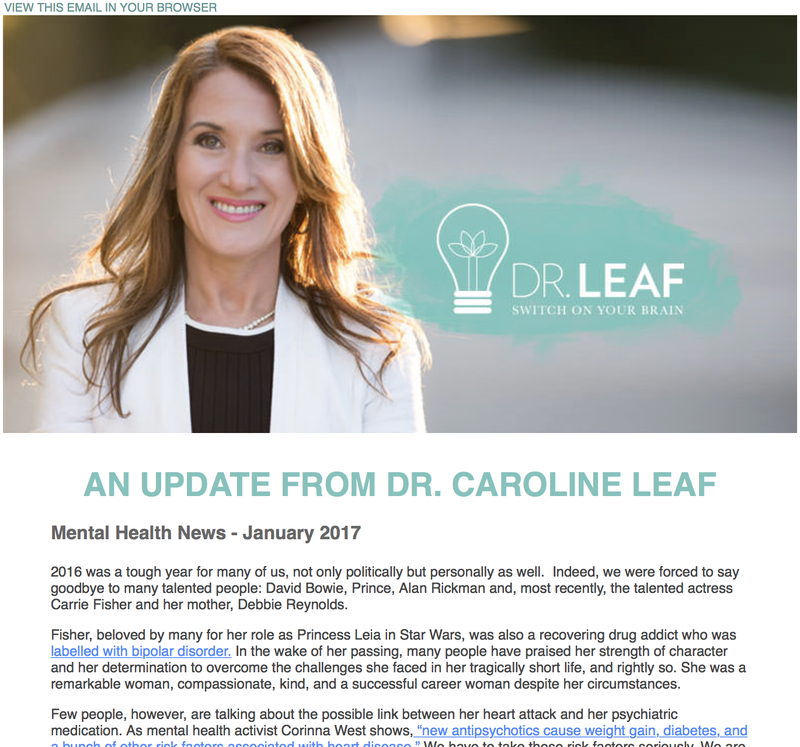 No longer content with just wilful ignorance, Dr Caroline Leaf has stooped even further by using the death of a beloved actress as a sick segue against psychiatric medications. Dr Caroline Leaf is a communication pathologist and self-titled cognitive neuroscientist. She markets herself as an expert in neuroscience and mental health despite not knowing how genes work (https://cedwardpitt.com/2014/09/27/dr-caroline-leaf-and-the-genetic-fluctuations-falsehood/ and https://cedwardpitt.com/2017/01/07/dr-caroline-leaf-the-christian-churchs-anti-vaxxer/). 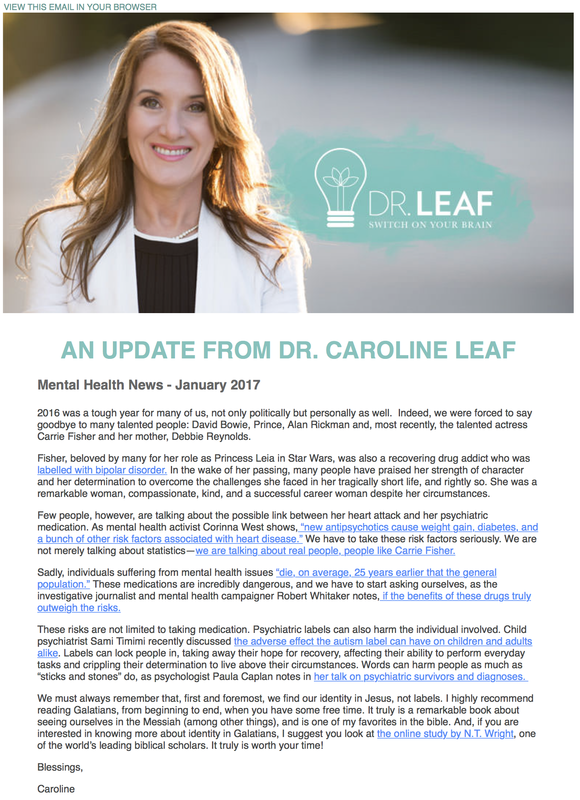 In her latest “Mental Health News – January 2017” e-mail newsletter, Dr Leaf makes some astounding and outlandish statements about mental health. She starts by claiming that Carrie Fisher’s death was ultimately caused by the psychiatric medications she was taking. Dr Leaf, no one’s talking about the possible link between her heart attack and her psychiatric medication because we respect the Carrie Fisher too much and would rather celebrate her life and achievements, not perform a hypothetical post-mortem motivated by prejudiced speculation. No one’s talking about the possible link between her heart attack and her psychiatric medication because no one really knows what caused Carrie Fisher’s heart attack. No one knows if she had any other risk factors for heart attacks, or what medications she was on. There could be a dozen other reasons why she had a heart attack. No one else is asking because it’s none of our business. No one’s talking about the possible link between her heart attack and her psychiatric medication because we know that psychiatric medications do much more good than harm. No one is talking about the possible link between her heart attack and her psychiatric medication because it’s highly disrespectful to use someone’s death to promote your political or ideological position. Using Carrie Fisher’s death as a segue to your soapbox about psychiatric medications is like someone using Princess Diana’s death as an opportunity to talk about the dangers of speeding in tunnels. It’s ungracious, unbecoming, and in poor taste. What’s even more dishonouring to Carrie Fisher is that Dr Leaf’s claims about psychiatric medications are not accurate. Notice the giant hole in her argument? She assumes that the increased risk of death in those with mental illness is the medications they’re on, just like she’s assumed that Carrie Fisher died because she was taking psychiatric medications. That’s confirmation bias, not science. In other words, the life expectancy of people with schizophrenia is shorter than the rest of the population, but it’s much shorter in schizophrenics not on meds. Psychiatric medications help people with schizophrenia live longer. In fact, the use of any anti-psychotic medication for a patient with schizophrenia decreased their risk of dying by nearly 20%  whereas the risk of dying for schizophrenics who didn’t take anti-psychotics was nearly ten times that of the healthy population . Psychiatric drugs aren’t “incredibly dangerous”. Like any tool, when used in the right way, they can bring radical transformation. What IS incredibly dangerous is the disingenuous and ill-informed making libellous and inaccurate statements about medications they don’t understand. * The right diagnosis gives hope – hope that comes from receiving the right treatment and not wasting time, money and energy pursuing the wrong treatment. * The right diagnosis gives power – it empowers people by giving them the ability to make accurate decisions about what’s best for themselves and their loved ones. * The right diagnosis gives certainty – in many situations, knowing what the diagnosis is reduces unnecessary anxiety and fear. Imagine that you had a freckle on your arm, and it started growing suddenly. You go to the doctor, and the doctor says that the freckle is actually a skin cancer. Does that label lock you in and take away your hope? Of course not. It gives you the certainty of knowing that treatment is needed, and the power to decide if you want that treatment. And it gives you hope that with the right treatment, you can continue to live a healthy life. In the same way, a psychiatric diagnosis doesn’t lock people in and remove their hope. A child who understands that they have autism can stop beating themselves up for being ‘odd’ and instead, they can understand that their different wiring gives them special powers that other kids don’t have. Psychiatric labels do not harm an individual, it’s the backwards opinions of so-called mental health experts that harm individuals with psychiatric illness. The stigma of a diagnosis is related to the way in which society treats individuals with that diagnosis, not the diagnosis itself. Perpetuating the myth that that ‘depression and autism aren’t really diseases’ reduces the acceptance of society for those who suffer from those conditions. That’s what causes harm. Dr Leaf should apologise to her followers for showing such disrespect for Carrie Fisher, and to all those who take psychiatric medications. Carrie Fisher spent her life supporting people with mental illness, trying to break down the stigma of psychiatric illness and treatment. Her life’s work should be celebrated, not defaced by Dr Leaf and her unscientific opinion. Well, this is my first post for the new year. 2016 was certainly historic! In 2016, the Oxford Dictionaries Word of the Year was “post-truth”. Post-truth describes the concept “in which objective facts are less influential in shaping public opinion than appeals to emotion and personal belief”. While the popularity of the word rose in step with the popularity of the US President-Elect, post-truth as an idea has been building more and more over the last decade or so. It’s the driving force behind other cultural phenomena of our modern world, like the alternative health and the anti-vaccination movements. It’s also the secret to the success of Caroline Leaf. There is no scientific evidence to support any of these claims, but that hasn’t stopped her claiming, because Christians and the leadership of the Christian church believe her without question. In the last twenty-four hours, Dr Leaf put up two separate social media posts which follow the same pattern – repeated mistruths with no basis in fact. 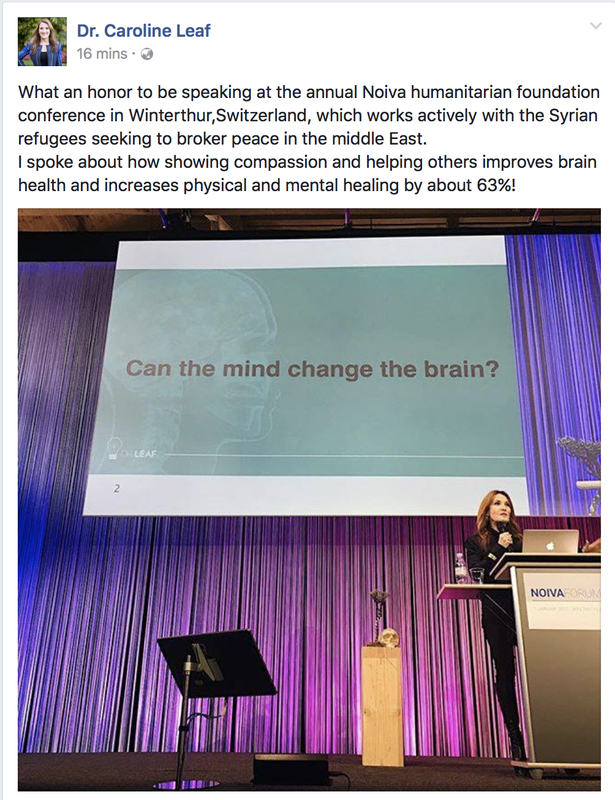 On the photo she put up on social media to gloat about her little jaunt to Switzerland, the Powerpoint in the background reads, “Can the mind change the brain?” Again, the answer is a clear ‘No’! She tried to argue the same nonsense in her TEDx talk in early 2015 (https://cedwardpitt.com/2015/03/26/the-tedx-users-guide-to-dr-caroline-leaf/). It was wrong then, and it’s still wrong now. Unless Dr Leaf’s found some better resources, NOIVA should ask for their money back. They could have fed a lot of refugees for the wasted cost of hosting Dr Leaf at their conference. Dr Leaf’s second social media post was even more egregious. WRONG! Absolutely wrong. There is NO scientific evidence that supports this statement at all (https://cedwardpitt.com/2014/09/27/dr-caroline-leaf-and-the-genetic-fluctuations-falsehood/). DNA is stable. It doesn’t “fluctuate by the minute”. It’s not influenced by our thoughts or our choices. We may be stuck in a post-truth world but science is not, and will never be, post-truth. Your belief in the cancer-fighting properties of turmeric doesn’t make turmeric cure cancer. Your opinion that the MMR vaccine causes autism doesn’t change the concrete scientific evidence that it doesn’t. By the same token, Dr Leaf might believe that our thoughts and choices change our DNA, but it doesn’t matter how many times Dr Leaf repeats the same fiction, it still doesn’t make it fact. She can repeat ad nauseum her belief that the mind controls the brain, or our mind changes matter through quantum entanglement, or depression isn’t a disease, or all of our illnesses come from thoughts. None of them were true the first time she made each outrageous claim, and they still aren’t true now. Scientific truth doesn’t change depending on what suits your opinion. In fact, all Dr Leaf is doing by continually perpetuating her stock of mistruths is to disempower her audience. Rather than encourage people to follow the facts, they are sucked into a vortex of wasted money and time. Precious resources are spent chasing wild geese instead of putting them towards something more meaningful. NOIVA diverting funds to support Dr Leaf’s fees instead of feeding refugees is a perfect case in point. Worse, Dr Leaf’s teaching discourages people from taking effective medications and seeking effective treatments which can only lead to greater suffering in those who are vulnerable. In this sense, Dr Leaf is like the anti-vaxxer of the Christian church, discouraging her followers from seeking scientifically sound treatments in favour of belief in erroneous and invalid actions with no proof of efficacy and a real risk of harm. When will the leadership of the Christian church stand up for their parishioners and stop Dr Leaf’s fictions from infecting their churches? The answer should be ‘now’, and that’s a fact. As is my usual habit, I sat down tonight to do something useful and wound up flicking though Facebook instead. Procrastination … avoidance behaviour … yeah, probably. But at least this time it turned out to be rather useful procrastination, because I came across a science news story on Science Daily about a study linking the use of anti-depressants in pregnancy with an 87% increased risk of autism. Actually, this is old news. Other studies have linked the use of some anti-depressants with an increased risk of autism, such as Rai et al in 2013 . The latest study to come out used data from a collaboration called the Quebec Pregnancy Cohort and studied 145,456 children between the time of their conception up to age ten. In total, 1,045 children in that cohort were diagnosed with autism of some form, which sounds like a lot, but it was only 0.72%, which is actually lower than the currently accepted prevalence of autism in the community of 1%. What the researchers got excited about was the risk of developing autism if the mother took an antidepressant medication at least at one time during her pregnancy. Controlling for other variables like the age, wealth, and other health of the mothers, a woman who took an anti-depressant during pregnancy had a 1.87 times greater chance that her baby would end up with ASD, compared to women who did not take an anti-depressant . An 87% increase sounds like an awful lot. In fact, it sounds like another reason why anti-depressants should be condemned … right? Well, like all medical research, you’ve got to consider it all in context. First, you’ve always got to remember that correlation doesn’t always equal causation. In this particular study, there was a large number of women being followed, and their children were followed for a long enough time to capture all of the likely diagnoses. So that’s a strength. They also tried to control for a large number of variable when calculating the risk of anti-depressants, which also adds more weight to the numbers. Although the numbers are strong, studies like these can’t prove that one thing causes another, merely that they’re somehow linked. It might be that taking anti-depressants causes the brain changes of autism in the foetus, but this sort of study can’t prove that. Even if the relationship between anti-depressants and ASD was cause-and-effect, what’s the absolute risk? Given the numbers in the study, probably pretty small. With a generous assumption that ten percent of the study population was taking anti-depressants, the increase in the absolute risk of a women taking anti-depressants having a child with ASD is about 0.5%. Or, there would be one extra case of autism for every 171 that took anti-depressants. Hmmm … when you think of it that way, it doesn’t sound as bad. You also have to consider the increase in risk to women and their offspring when they have depression that remains untreated, or in women that stop their anti-depressant medications. There is some evidence that babies born to women with untreated depression are at risk of prematurity, low birth weight, and growth restriction in the womb, as well as higher impulsivity, poor social interaction, and behavioural, emotional and learning difficulties. For the mother, pregnant women with depression are more at risk of developing postpartum depression and suicidality, as well as pregnancy complications such as preeclampsia, and an increase in high-risk health behaviour such as smoking, drug and alcohol abuse, and poor nutrition. Women who discontinued their antidepressant therapy relapsed significantly more frequently compared with women who maintained their antidepressant use throughout pregnancy (five times the rate) . Yes, there’s good evidence that taking anti-depressants in pregnancy is linked to an increased risk of a child developing autism. But the overall risk is still small. There is one extra case of autism for every 171 women who take anti-depressants through their pregnancy. And this should always be balanced out by the risks to the mother and child by not adequately treating depression through pregnancy. If you are pregnant or you would like to become pregnant, and you are taking anti-depressants, do not stop them suddenly. Talk to your GP, OBGYN or psychiatrist and work out a plan that’s best for you and your baby. Rai D, Lee BK, Dalman C, Golding J, Lewis G, Magnusson C. Parental depression, maternal antidepressant use during pregnancy, and risk of autism spectrum disorders: population based case-control study. Bmj 2013;346:f2059. Boukhris T, Sheehy O, Mottron L, Bérard A. Antidepressant use during pregnancy and the risk of autism spectrum disorder in children. JAMA Pediatrics 2015:1-8. Chan J, Natekar A, Einarson A, Koren G. Risks of untreated depression in pregnancy. Can Fam Physician 2014 Mar;60(3):242-3. One of my Facebook friends messaged me a link the other day. It was to an article that had been popping up on his Facebook feed, originally published by Health Impact News (http://goo.gl/V3A5Mb). The article is a report by John P. Thomas, building on the previous work of Andrew Moulden. Moulden failed his medical residency in Canada (http://goo.gl/BBKG5z), but used his doctorate in psychology to promote himself as a doctor. Moulden Anoxia Spectrum Syndromes isn’t found in any medical textbook, and there is no evidence that Autism, Alzheimer’s, Gulf War Syndrome, food allergies and Shaken Baby Syndrome are at all causally related. Besides, the term ‘anoxia’ is a medical term meaning ‘without oxygen’. Moulden is obviously suggesting that every one of those disparate conditions is fundamentally caused by a lack of oxygen to somewhere, and while his logic has many flaws, this is the fatal one. 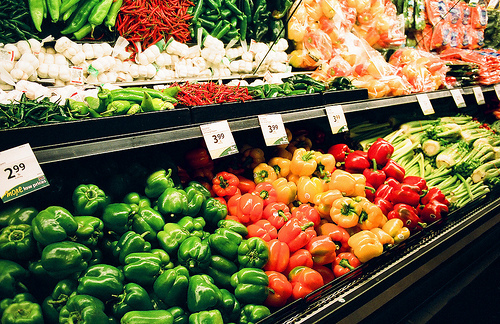 Food allergies are not related to lack of oxygen. Neither are reactions to the Gardasil vaccine. And we know that Autism is defined by structural and functional changes in the brain that occur in the womb, and can be detected as early as a month after birth . Autism is primarily genetic – autistic brains have excess numbers of dysfunctional nerve cells that are unable to form the correct synaptic scaffolding, leaving a brain that’s large [2, 3], but out-of-sync. There is nothing about autism that’s related to low oxygen. ADHD is similarly genetic and neurodevelopmental in origin . The only thing suffering from lack of oxygen is Moulden’s theories. Thomas then tries to extend this already tenuous medical hypothesis by claiming that vaccines cause damage to capillaries in ‘watershed’ areas which, according to his definition (not the medical definition), are “very small areas of tissue (groups of cells) that are served by a single blood vessel called a capillary” (http://goo.gl/4IlUI7) He suggests that certain cranial nerves are vulnerable to these ‘watershed’ injuries, which then result in changes in the way the face moves. In other words, he’s suggesting that vaccinations essentially cause strokes. From here, the article becomes a bamboozling cacophony of legitimate but irrelevant facts, diagrams, factoids, and recommendations. For example, Thomas explains the signs of damage to the third, fourth, sixth and seventh cranial nerves, and cites the damage by actual strokes as examples. Well, that’s fine, except that real strokes don’t involve damage to capillaries, but blockage of arteries, and have nothing to do with vaccination. He also makes statements that are simply wrong, like “The seventh cranial nerve primarily controls the lower half of the face” (actually the seventh cranial nerve, also called the facial nerve, controls the muscles of the whole face – http://goo.gl/m9S7Gd). And, “When we see seventh cranial nerve damage, we can be sure that the damage is not isolated to the seventh cranial nerve – the damage is happening everywhere” (except in Bells Palsy … and some parotid tumours … and some strokes … and lots of other things). He also makes the ridiculous claim that autism causes facial droop without explaining why, suggests that weakness of the muscles of the eyes controlled by the sixth cranial nerve is often the first sign of vaccine damage, and that ‘watershed’ damage to the brainstem from vaccination is the cause of SIDS. Thomas then attempts to justify his conjecture by describing the case of a single baby boy whom he claims died from sudden infant death post vaccination – “His family and his physicians watched him slowly die while the respirator did his breathing for him. Basically they were watching his brain as he went through the stages of sudden infant death after vaccine exposure”. Except that death after nineteen days is not ‘sudden’, and the description of this child’s tragic death is nothing like SIDS. And his only reference to this case? Not an official forensic report, but a ‘report’ written by Andrew Moulden, which was simply an offensive and detestable attempt to leverage the heart-wrenching death of a fifteen month old boy to push his idealistic agenda (http://goo.gl/ysoCtQ). There is no credible medical evidence to back up any of Thomas’s claims, nor the claims of Moulden before him. Together, they openly defy centuries of scientific knowledge, modern science, and the observations of every parent whose children have been vaccinated. Lets face it – if vaccines really caused mini-strokes, we wouldn’t need the dubious work of Moulden and his disciples to discover it. We would have all seen it. There are a lot of very questionable theories that get promoted on the internet as valid science. Don’t fall for it. 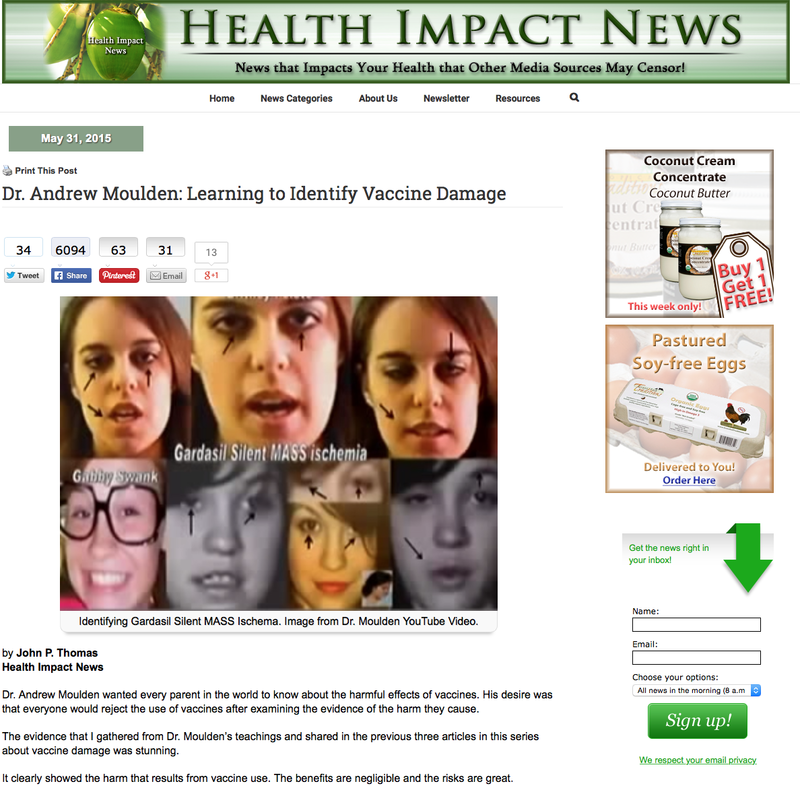 There’s no evidence for Moulden Anoxia Spectrum Syndromes, and the only connection between conditions like Irritable Bowel Syndrome, Shaken Baby Syndrome and Chronic Fatigue Syndrome is not vaccination, but the pathetic attempt to try and connect them by pseudoscientists with an idealistic barrow to push. Pierce K. Exploring the Causes of Autism – The Role of Genetics and The Environment (Keynote Symposium 11). Asia Pacific Autism Conference; 2013 10 August; Adelaide, Australia: APAC 2013; 2013. Courchesne E, Carper R, Akshoomoff N. Evidence of brain overgrowth in the first year of life in autism. JAMA : the journal of the American Medical Association 2003 Jul 16;290(3):337-44. Shen MD, Nordahl CW, Young GS, et al. Early brain enlargement and elevated extra-axial fluid in infants who develop autism spectrum disorder. Brain : a journal of neurology 2013 Sep;136(Pt 9):2825-35.